Looking for more? Take some time to grow your faith and gain your master’s with online and onsite courses and workshops for spiritual renewal and ongoing faith formation. who hold or seek to hold leadership positions within a variety of roles within education ministry of the Catholic Church. Felician College’s Online Institute for Religious Studies and Education Ministry has launched! . Course and registration payment information can be found on the website: www.felician.edu. Be sure to click on the link: Online Religious Studies – Four Week Program. Additional courses will be offered throughout the year. 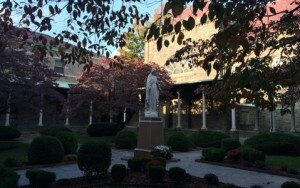 St. Joseph’s Seminary was founded in 1896 for the formation of men for the priesthood. Since 1977, St. Joseph’s Seminary has offers degrees to lay men and women, men and women in consecrated life, and clergy who wish to deepen their understanding of the Catholic faith through systematic study, or who are called to serve the Church in roles of leadership. Join qualified lay men and women, consecrated religious, and clergy in earning a degree or certificate or as an auditor . Four Locations to meet the needs of all our students. Yonkers, Huntington, Douglaston, & Poughkeepsie. United States, and from around the world in a program informed by what we call “practical theology,” an approach that is informed by the themes of faith and also reads “the signs of the times” in the service of transformation. Our students participate in a welcoming learning community, pray the graces of the Spiritual Exercises of St. Ignatius Loyola, and and benefit from being a part of a Jesuit and Catholic university with a national reputation, including an award-winning library. Students integrate their knowledge of the Catholic faith with their own ministry. They develop ministerial proficiency by combining in-depth study of the Christian theological tradition with an appreciative and critical understanding of the contexts in which they minister. These include the sociocultural context of their ministry, the personal context of participants’ own faith development and spirituality, and the institutional context and organizational dynamics of the ministry sites in which they work. You will find many good reasons to do your graduate studies at Franciscan University of Steubenville. There’s the academic excellence of our eight master’s programs, which are rooted in passionate Catholicism. There’s the vital interaction of faith and reason, which leads to “a greater love for truth” and “a more comprehensive understanding of the meaning of human life” (Pope John Paul II, Ex corde Ecclesiae). There’s the excitement of living in a community of scholars who are faithful to the magisterium and guided by St. Francis’ vision of love for the Catholic Church. In short, Franciscan University offers a fully Catholic graduate education that can transform your mind and heart while advancing your career and preparing you for your irreplaceable role in the new evangelization.